I've always loved nature. One of the things I love most about L.M. Montgomery's books is her descriptions of the beauty of her surroundings in Prince Edward Island. I always hoped I would be able to see it in person someday. 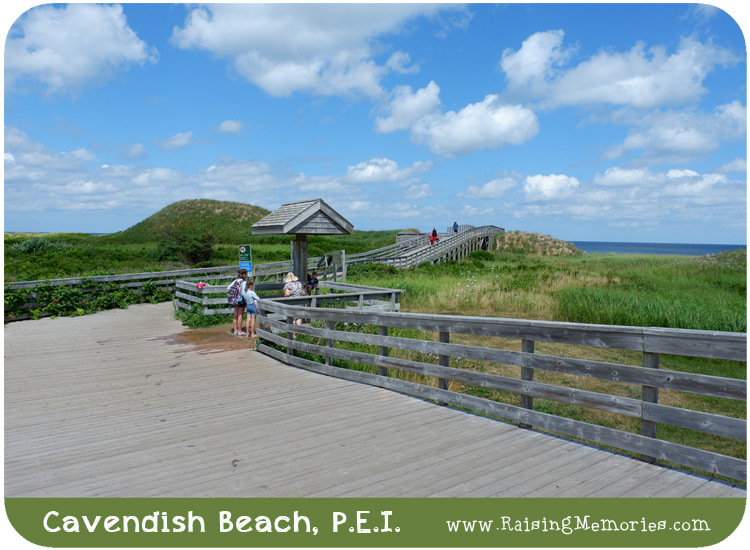 When we arrived at Cavendish Beach, I came over a grassy hill to take in an idyllic view: sandy beach surrounded by red cliffs with blue skies. I had a moment to myself, feeling very alive and like I had "made it" to a place in time that I had spent years thinking of while never being quite sure that I would make it. It was pretty awesome and I'm glad I got to share it with my little family! This is the gorgeous view as you approach Cavendish beach. Doesn't it look like something out of a painting? Just over that hill is a beautiful beach where we spent time playing with sand, cooling off in the water, and just taking in the beauty of nature and the peaceful sound of the gentle waves. In one area of the beach there were a lot of rocks along the shore. 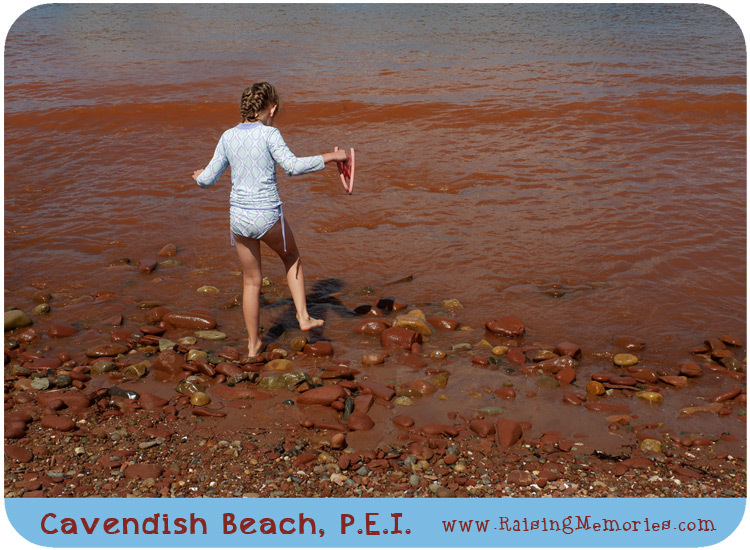 This was also the spot that was the most "red" and Katrina was determined to dip her toes into the ocean by the red sand, despite the challenges of the rocks! 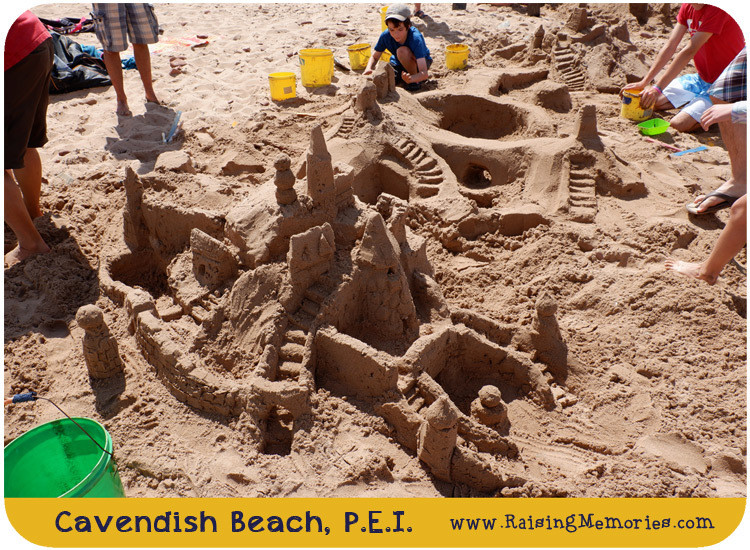 Another fond memory from this trip to the beach was participating in the Sensational Sandcastles program run by Parks Canada. This was so cool! There were sandcastle experts stationed at a section of sand with lots of buckets and tools, ready to instruct you (in English or French) and train you to build fabulous sandcastles. This program is free, and it's amazing! We can't wait to try to repeat what we learned next time we're at a beach!! 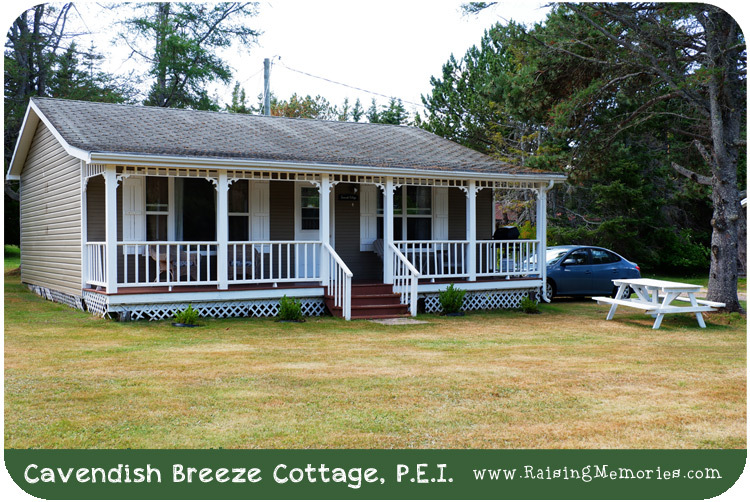 We stayed two nights at a cottage at the Cavendish Breeze Inn. The couple that runs this Inn is fabulous. We were continually greeted with genuine smiles and kindness. From what we saw, they were totally on top of any problems, too. When we went to do our laundry, we found that one of the machines was out of order. When I returned to switch our laundry to the dryer, I found the owner working to fix the broken machine already. I was impressed to see that he was committed to solve the problem right away! Our cottage had everything we needed: a large kitchen and living room, a bathroom, and two bedrooms. We were so busy during our trip that we didn't get a chance to cook in the kitchen, but the fridge, sink, table, and microwave all came in very handy for us! There is wifi here, but the signal is not very strong and there were several times that I gave up on getting connected or went out to our little porch or the main building (separate from our cottage) to get a signal. This is probably not such a bad thing if you're staying at a cottage to get away from everything and relax, but if wifi is a necessity, be prepared for this. If you followed me on Instagram during our trip, you know that my posts dropped off when we got to P.E.I. and that's because I went too long without reliable wifi, so I just caught up after our return. 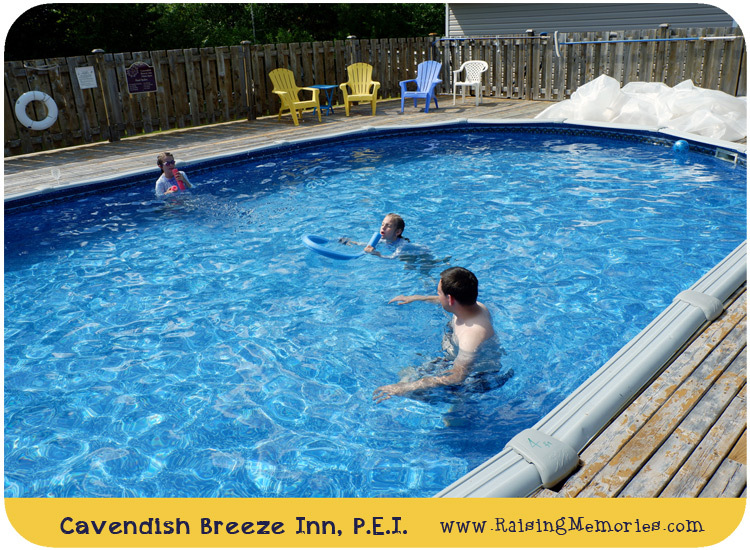 Our kids were, of course, thrilled to see that there was a pool behind our cottage! There was also a swing set and a laundry room. That laundry room came at a perfect time for us as we were at our halfway point for the trip, so we needed to wash everything. 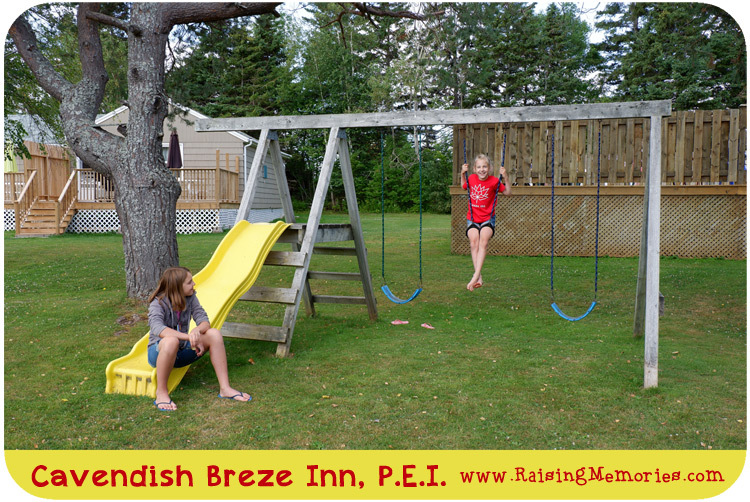 The Cavendish Breeze Inn is an excellent location to stay at if you're headed to the Cavendish area. 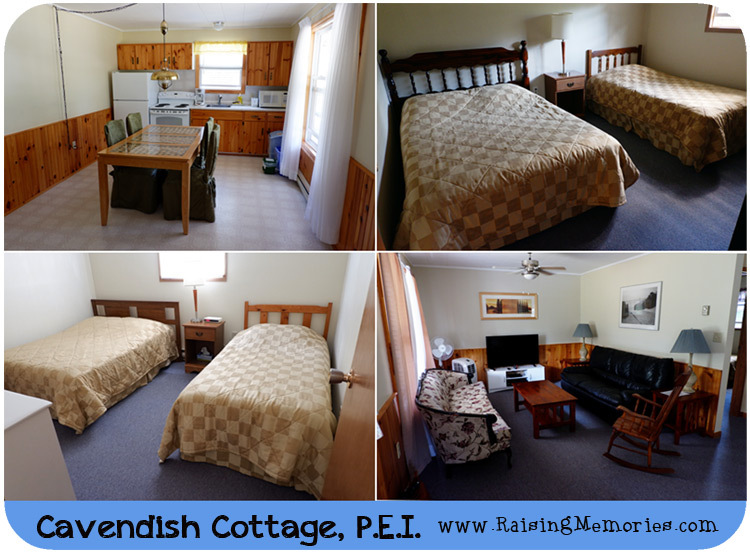 So many things are within a 5 minute (or less) drive including the Green Gables house, Avonlea Village, Cavendish beach and more. There's even an amusement and water park just down the road! 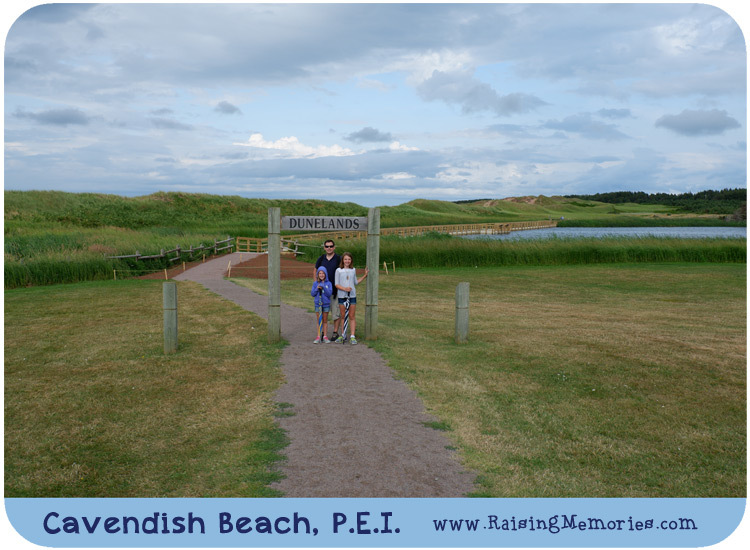 Our first night in Cavendish was also the night we drove back to Charlottetown for the Anne of Green Gables Musical. 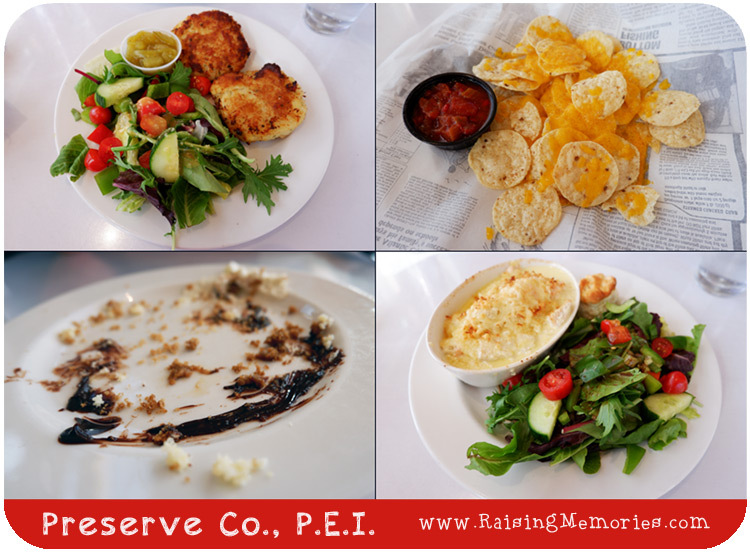 On our way from Cavendish to Charlottetown, we stopped in New Glasgow for dinner at The Preserve Company restaurant. We had a beautiful view of a river, out the window beside our table! The food was delicious. Pictured in the top left are the Maritime Fish Cakes which were made with potatoes and cod fish and were really delicious!. On the right is a children's menu item (Nacho chips, cheese & salsa) and in the bottom left is what was left of the cheesecake we ordered- it was gone before I could snap a photo! Next to that is the seafood bubbly bake and salad. This included shrimp, scallops, and salmon in a garlic butter and cream sauce topped with panko bread crumbs and parmesan cheese- very tasty! Of course Anne of Green Gables is a fictional story but the author lived on the island and this house belonged to her cousins. 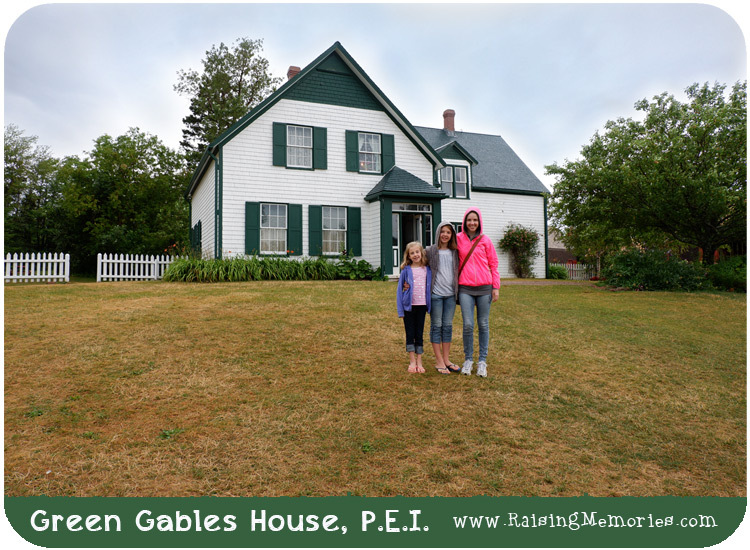 It sure looks like the inspiration for Green Gables and it was another bucket list moment, to see it in real life! :) Here I am with my girls, happily having made it to this little landmark! 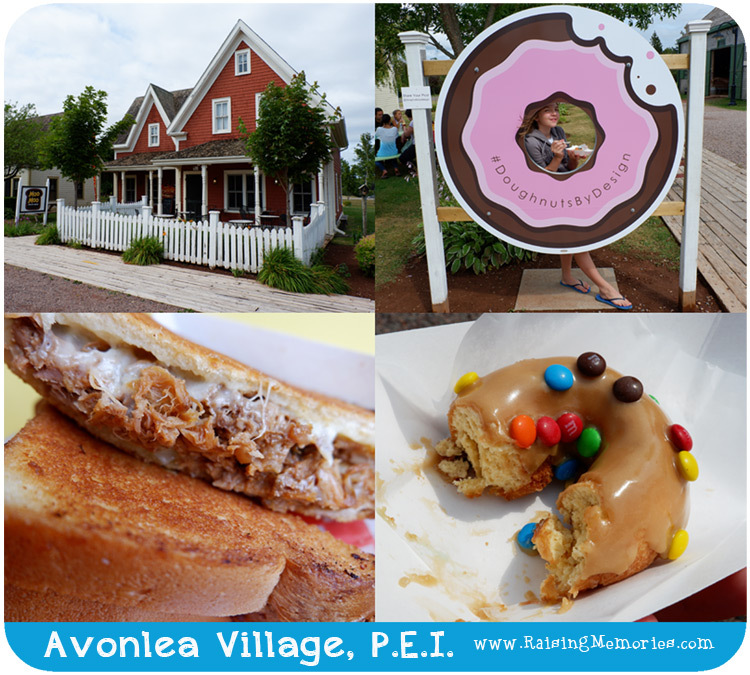 This little village inside of Cavendish is a collection of adorable buildings with shops and restaurants in them. You feel like you're walking around in Anne's time! 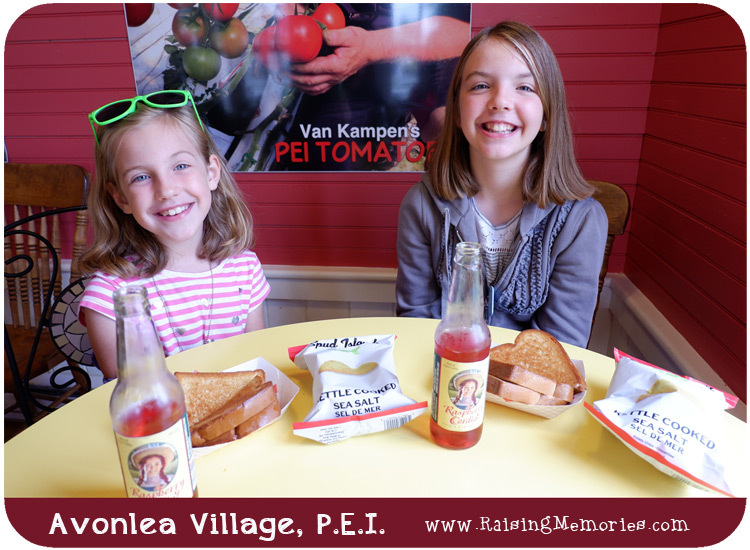 We stopped here for lunch, at a place called Moo Moo Grilled Cheese where we tried some Raspberry Cordial and PEI Pulled Pork grilled sandwiches. We also made a visit to Doughnuts By Design (the two photos on the right in the collage below). Sadly they were so busy that day that they were out of most of their flavours, but we tried one and it was amazing!! I wish I could go back and sample more flavours!! Here we've come to another one of my favourites from the whole trip: Cavendish dunelands and cliffs. 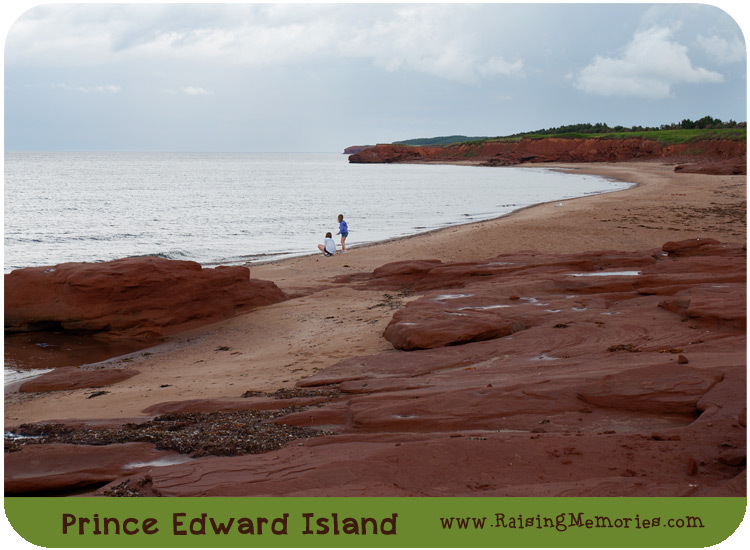 We took an afternoon and walked down this path just to the side of the entrance to Cavendish beach (another vista out of a painting) and then drove out along the shore, to see some red cliffs. There we were on red rock, with red sand and red cliffs- like our own private beach with no one around. It was so beautiful and pretty awesome to be the only ones there, with no crowds of tourists to share it with. I have more photos of this place, but I'll save them for another post. 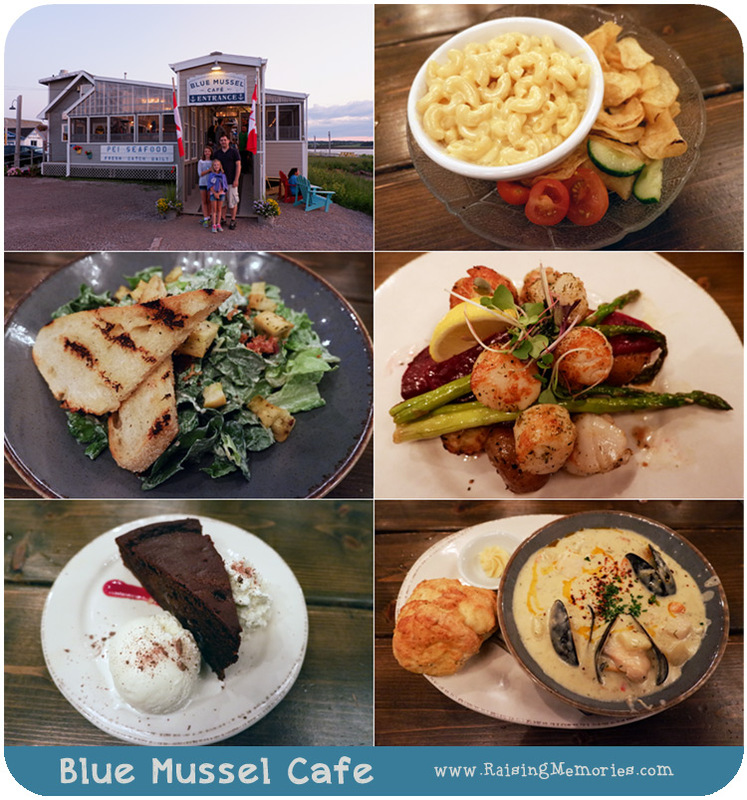 That was our last night in PEI and we planned to eat at the Blue Mussel Cafe. This restaurant is ridiculously popular! I have never waited so long for a table (one hour and 45 minutes) but apparently that is not uncommon! North Rustico Harbour is beautiful though, and we took some time to explore it while we waited. 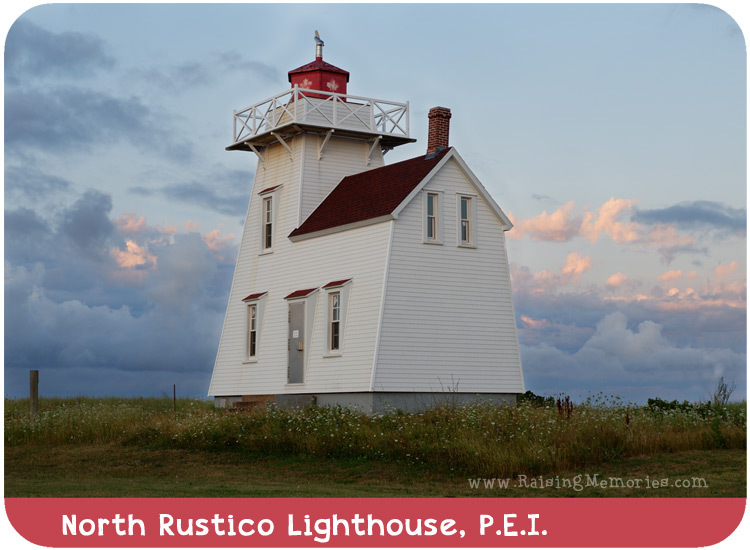 I got this photo of the North Rustico Lighthouse while we were there. Talia and I both tasted our first mussels during this meal. I was impressed with her for trying them! I ordered scallops and loved them (middle, right photo). The kids' menu food was delicious and well priced, which I appreciated because it allowed us to eat somewhere nice without spending too much on kids who didn't want to eat the fancier food. It really is a lovely world, and it has been lovely to travel with my family to see some of it this summer! Keep following along because I'll be sharing our experience in Nova Scotia next! 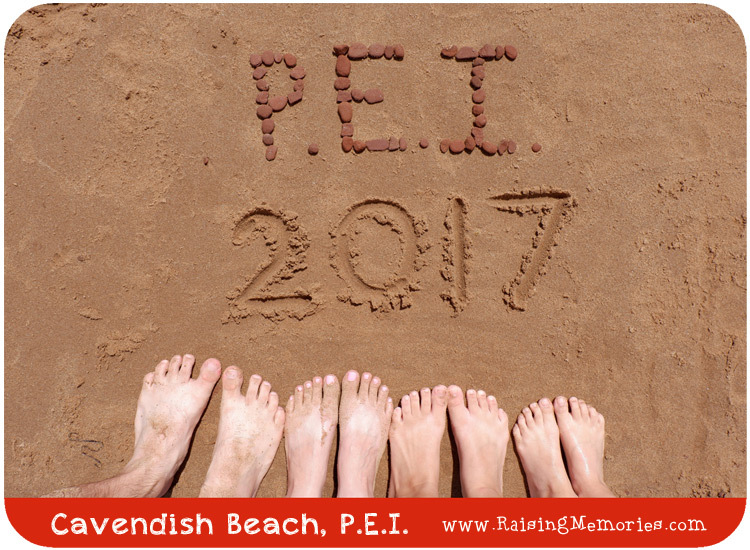 Many thanks to Tourism P.E.I. for their hospitality and assistance with planning our trip! Looks like you had a beautiful vacation! We love our little trips to the Island. It is only a couple hours away, but such a unique place. It was so lovely! That is so nice that you are close enough to visit more often! I think it would be wonderful to get back there and see more of the island another time! I loved every bit of this! I went to PEI 15 years ago and would go back in a heartbeat!! One of my favourite places on earth! I will have to re read Anne again while I wait... I love that quote. Pick me, pick me! I want to go. This looks so...not just fun, but meaningful, and lovely. So beautiful, and wow that sand castle is impressive! Love that they have a program to teach you how to build better sand castles. Looking at these photos makes me think I should break out my Ann of Green Gables books again. Isn't it?! I'm sad we didn't get to another beach to test our skills after that! Hi Heather:). 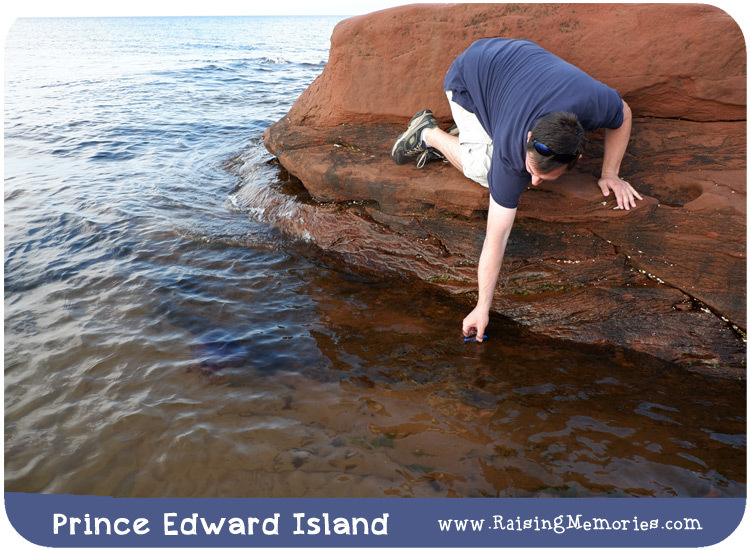 You have totally sold me on PEI, thank you for sharing your beautiful photos. Aw, that's awesome :) I hope you get to go and see it all in person! I grew up in Nova Scotia so we spent tons of time on PEI but I'm still impressed everytime we get a chance to visit. I love that, even though it's a huge tourist destination, it still has a small town feeling. It looks like you guys had a great time! Yes, it really is unique. We had that small town feeling in parts of New Brunswick as well. Thanks Debbie! Yes, the food was so good! OMGosh, this is on my bucket list! As a child who grew up watching Road to Avonlea and reading the Anne Green Gables books, this is my dream trip and this year (for Canada 150) I'm gonna make it happen! Thank you for the tips and information. Yes, same here!! I'm so glad you're going to get to go! PEI is one of the main places in Canada that I've always wanted to visit. It's on my bucket list for sure to explore this area out east. It looks like such a cool vacation spot! It was really good. We had so much fun exploring! Looks like a nice place to get away! I am lucky enough to go to P.E.I. every summer.My Mom and 2 sisters live there. What an amazing vacation! P.E.I. has always been on my bucket list too! What I would give to visit PEI. The history, the cottages, the beach! So impressive. My family history goes back to PEI with relatives still living there. I very grateful to see these pictures. Thank you. 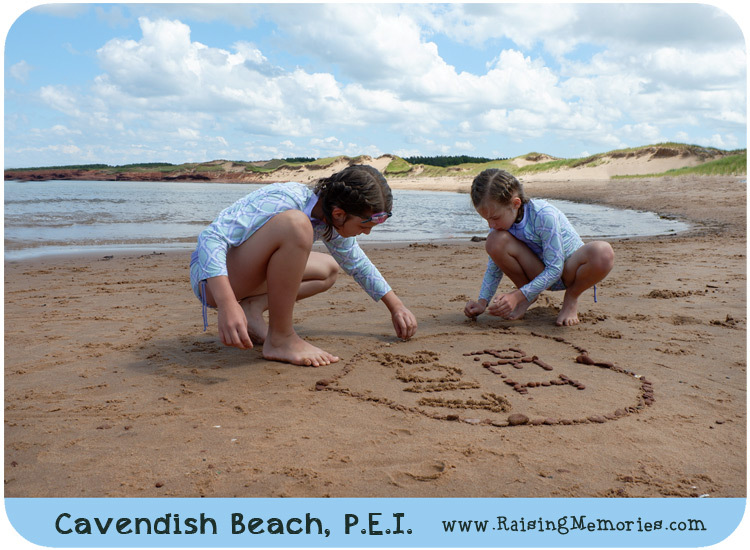 We visited PEI a number of years ago and it was a wonderful trip. Hunting for sea glass was one of my favourite times. Than having it made into jewelry by a local artist was wonderful. If you are ever in Georgetown check out Shoreline Design. The shop and it's owner are worth the visit. 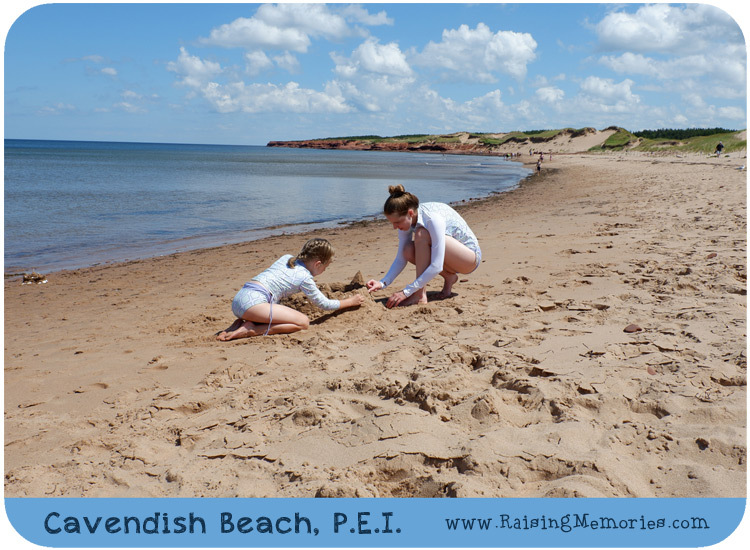 I will be referring to your post when I plan my PEI trip with my family next year! I've always wanted to visit PEI. It looks so peaceful and lovely. 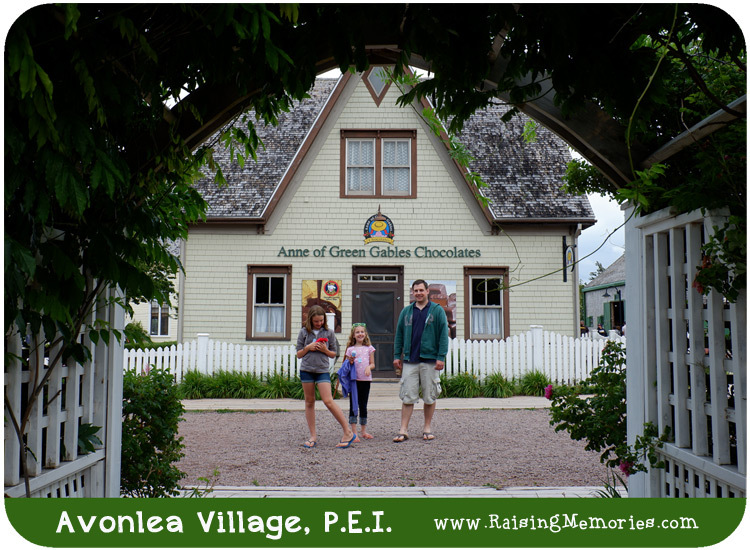 I love that they even have an Anne of Green Gables chocolate shop. 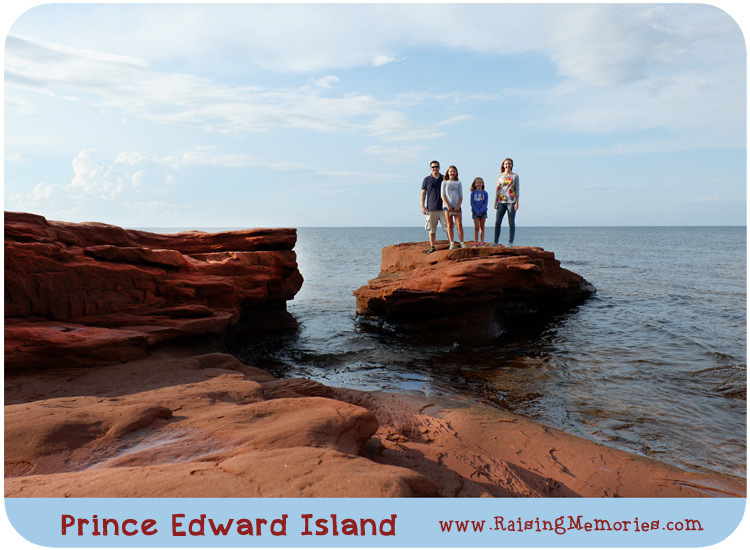 I’ve never been to Canada, but Prince Edward Island sounds like a great start for a family trip! Your trip looks so amazing. 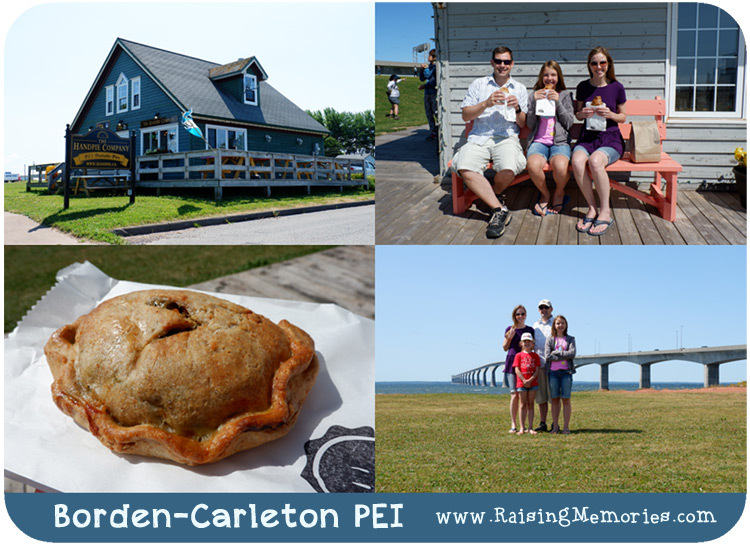 I have always dreamed of visiting PEI! Beautiful....hope to visit myself one day!! Beautiful photos of a beautiful place, one day I'll get there too - she said hopefully. That looks so fun ! Very beautiful , i love the pic of you all on the rocks ! The sandcastle build would be so fun to ! I have to visit someday i hope !